Pocket is a very intelligent dog who knows exactly how to get what she wants. As an Akbash, a breed known for being independent dogs often suited for being guard dogs, Pocket was born at a breeder who intended to sell her for these attributes. But Pocket seemed to decide at a very young age that a life of such hard work didn't suit her. "Akbash are not meant to be companion animals. 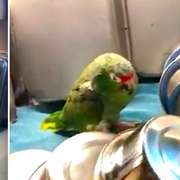 The breed is supposed to be aloof and not that friendly,” Kail Marie, Pocket’s loyal human, told The Dodo. 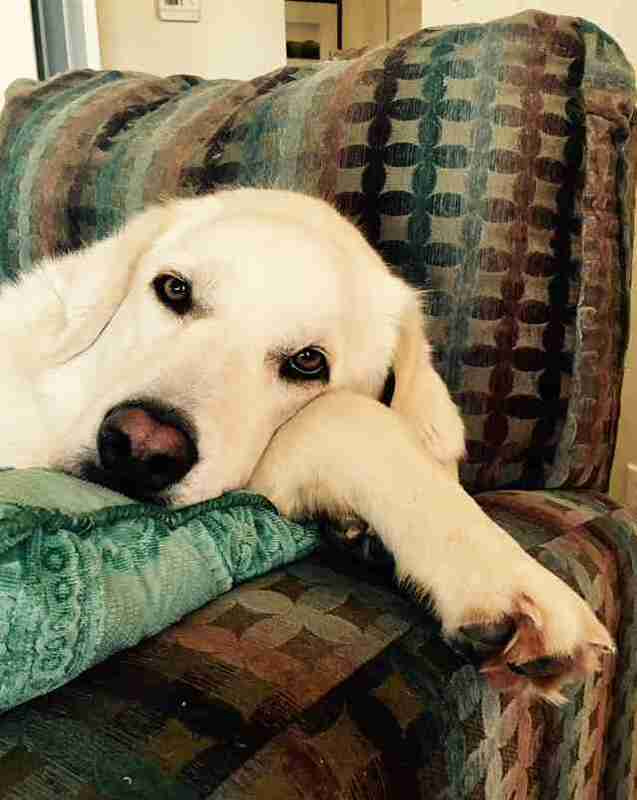 "They were bred as independent dogs that guard livestock without the intervention of people … We got her because she flunked her temperament testing." Pocket came to live at a rather unusual kind of home: Tallgrass Parrot Sanctuary, a sanctuary for discarded pet parrots (and some other kinds of rescued animals) in Kansas that Marie founded. "The breeder was searching for a home for her,” Marie said, and because the breeder knew that Marie was an animal lover and rescuer, the phone rang and Marie just couldn’t say no. That was five years ago, and ever since then, Pocket has been a big personality in a household full of other big feathered personalities. 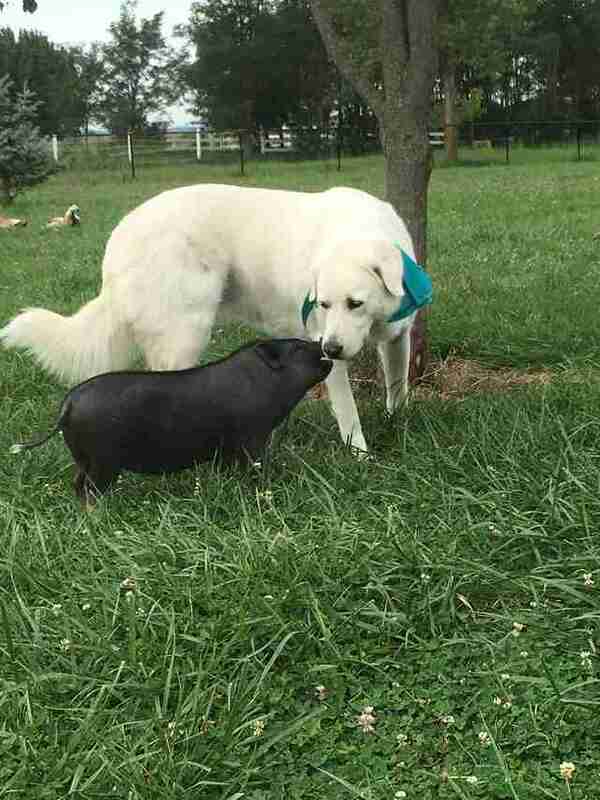 She has bonded particularly with Marie’s other dog Mouse, as well as Bink the rescue pig and Nick the cat. 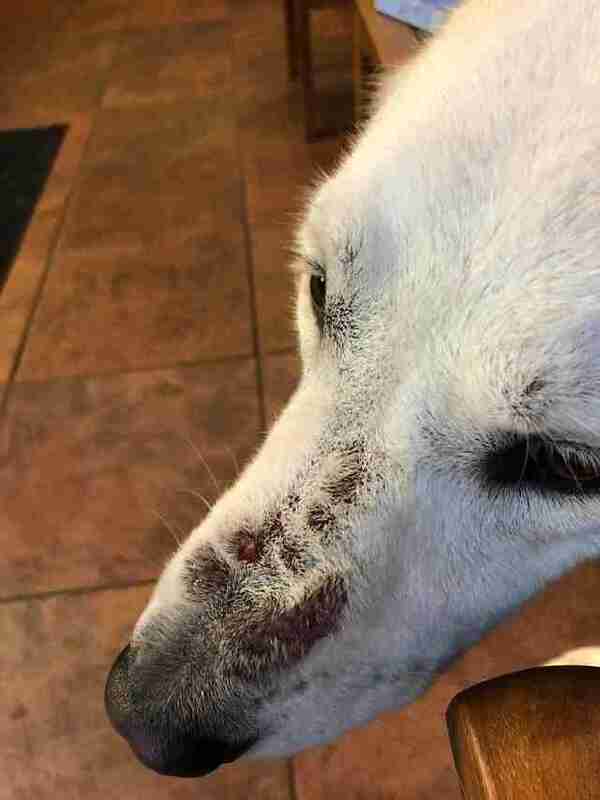 But Pocket has retained something of her rebellious nature, as Marie recently witnessed during a visit to Clinton Parkway Animal Hospital in Lawrence, Kansas. “Pocket had been stung by something and had a painful, swollen nose,” Marie said. 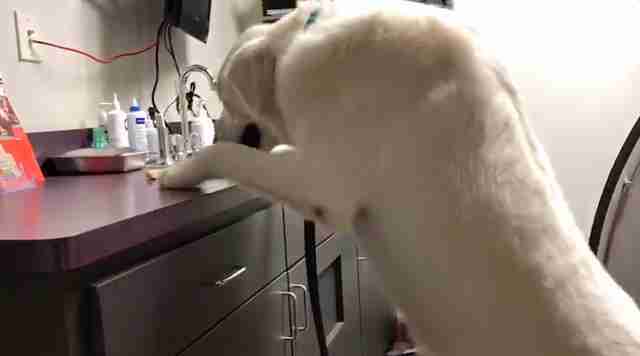 At the animal hospital, after looking her over and prescribing some medicine for Pocket’s nose, the veterinarian offered Pocket a treat for being such a good dog. "When the vet tried to give it to her she hid behind me,” Marie said. 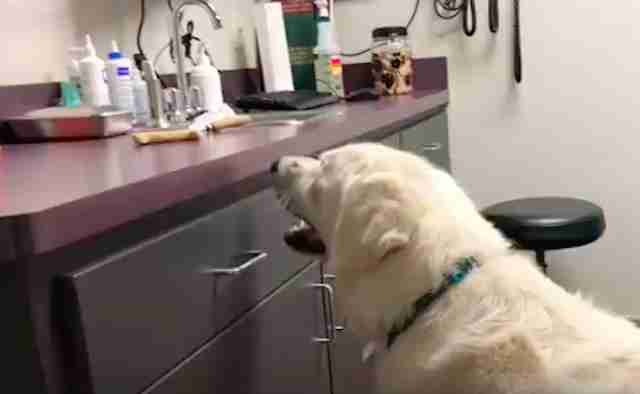 "She thought the vet was trying to trick her!" But when the vet left the room, Pocket came back out into the open — and she had a plan. Pocket went ahead and stole the treat from right off the counter. "As soon as the doctor left, Pocket helped herself!” Marie said. The treat was rightly hers, after all. You can help Tallgrass Parrot Sanctuary care for all of Pocket's rescued friends by making a donation.